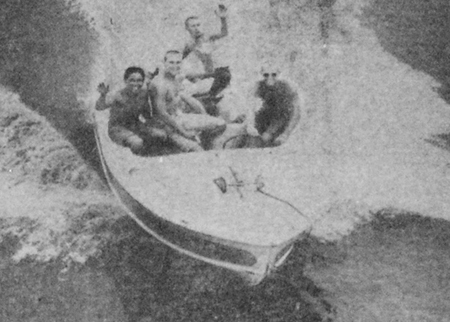 “This was my introduction to small boating in the Sea of Cortez,” Ray Cannon wrote about the adventure of Bob Francis, Roy Francis, Martin Rothschild and Kenneth Anderson in their 16-foot boats, the Bloody Mary II and the San Francisco Babe, both powered by twin Johnson 35-hp outboards. 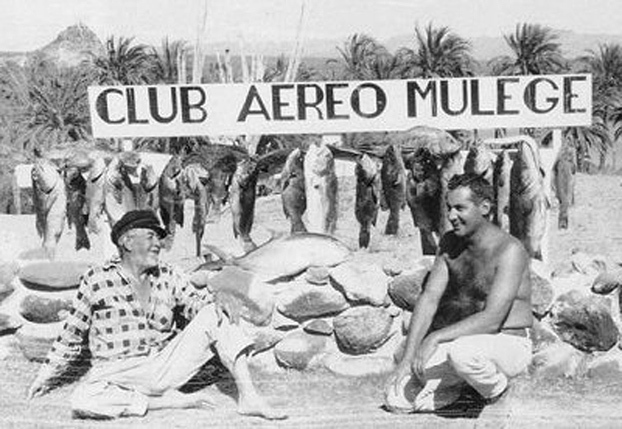 “And the trip was a thing of joy from start to finish,” Cannon continued about the first-ever recorded cruise from San Felipe to La Paz, chronicled in his January 11, 1957 Western Outdoor News column. A high school graduation gift of a one-week fishing trip to La Paz allowed Ralph Clock and his friend Derek McWhinney to spend the last week of June 1956 fishing and scouting the area. They discovered excellent fishing and ideal conditions from Derek’s 12-foot Glasspar with a 30-hp Evinrude. A plan began to take shape for 1958. Clock and his friends would embark on what would set the record as the longest Baja small boat trip, traveling all the way to Cabo San Lucas. But first would come a 1957 staging trip down 1,000 miles of dirt road in a three-quarter-ton Ford pickup fitted with a boat rack over the truck bed. That was an adventure in and of itself, leaving them only three days for camping and fishing Punta Coyote. Their success on that trip kindled their desire to return. The crew included Clock, age 19, McWhinney also 19 and Tad Fujita, 20, both of Midway City and Rick Van de Water, 16, of Long Beach. They borrowed a 15½-foot homemade boat built by Derek’s friend Tad with a wide beam of 7 feet, powered by Derek’s Evinrude. 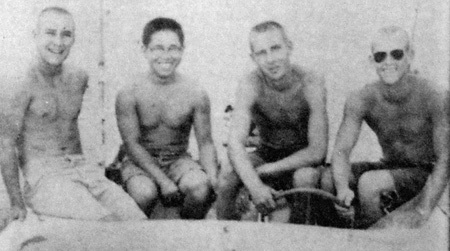 On June 17, 1958, Ralph, Derek and Tad departed from San Felipe. 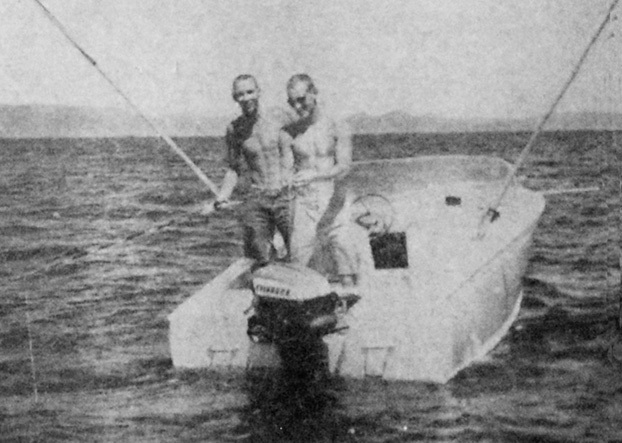 Later, at Loreto, Rick replaced Tad, who had to return home, unaware that if they completed the trip they would set an outboard record never before attempted. Once they loaded their equipment, they had so little freeboard that they had to leave some gear in San Felipe. 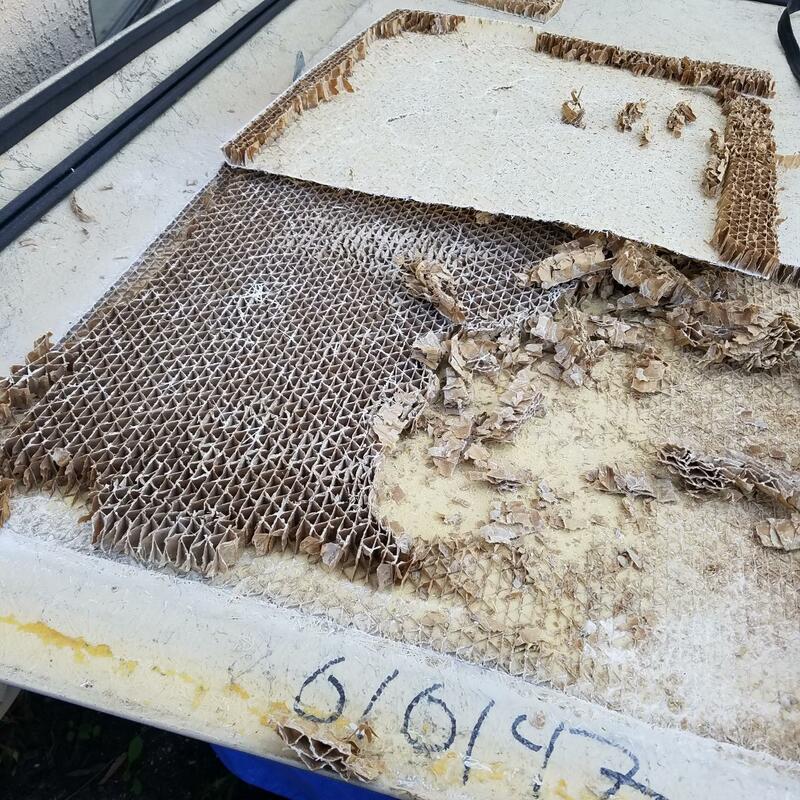 The cargo consisted of 10 5-gallon tins, two 6-gallon pressure tanks, 62 gallons of gas, a case of one-quart cans of oil, water, fishing equipment, an auxiliary 15-hp outboard, camping gear, canned food and cameras. Heading south on the mirror-like sea, the boat was so heavy they could only run at seven knots at full throttle. Excitement was high that first day, punctuated by a show of jumping manta rays as they made their way to a beach off San Louis Gonzaga. The first night, wind out of the south increased and by morning it was blowing 20 knots. A few miles from launching they pulled into another beach and waited for the howling wind to subside. The following day, calm seas helped increase the speed to nine knots as they burned off almost all of the fuel. They arrived at Bahia de Los Angeles in the early afternoon with only five gallons of fuel remaining. It took three hours to get fuel and by then, the tide had dropped, leaving the boat more than 100 yards from the water, delaying departure until the morning high tide. Cruising on calm seas at seven knots and trolling feathers, they released their first sailfish followed by dorado before they decided to quit fishing to make better time. 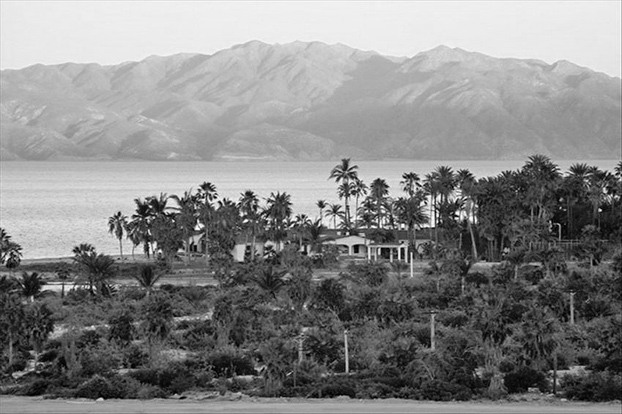 After spending the third night on a deserted beach between Bahia de Los Angeles and Santa Rosalia, they set out early the following morning. 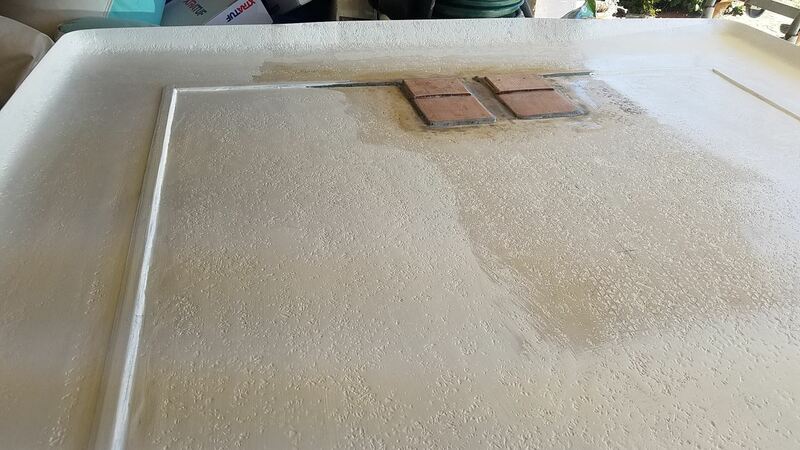 Hand-starting the outboard became increasingly difficult. Even with daily spark plug cleaning and re-gapping, it took 60 to 70 pulls to get the motor running. After a couple of days, the spring-loaded rewind device broke, requiring removal of the cover and winding the pull cord around the flywheel by hand prior to each pull, often taking an hour or more to finally get the motor going. At first, the boys thought the locals were teasing them, but later discovered that they were telling them the truth. 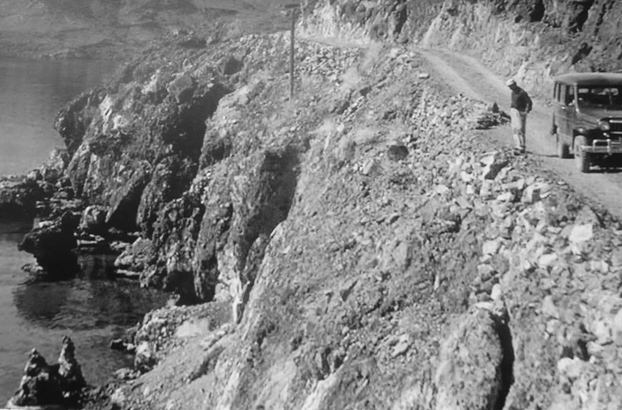 So they paid a Mexican villager $10 to drive a Jeep to Mulege and obtain enough fuel to reach Loreto, their next stop. They made a very sad mistake at Santa Rosalia. They drank contaminated water and all three boys fell deathly sick. They left at first light, hoping to make it to Loreto, and by noon they were south of Punta Chivato, then Mulege and Bahia Conception, catching an occasional dorado. However, cruising at seven knots and stopping to catch fish made it slow going. By the time they turned the corner at Isla Coronado, the sun was dropping quickly behind the mountains. Lights on the beach a few miles ahead of Flying Sportsman’s Lodge were visible. As they beached the boat, guests from the hotel greeted them and invited them to dinner to hear their tales of the trip so far. They fished off the north end of Isla Carmen the following morning, catching and releasing marlin. Unfortunately, Tad had to return to his family’s strawberry farming business in Orange County, so he flew home and Derek’s cousin and Clock’s high school classmate, Eric Van de Water, replaced him. Another day of extraordinary fishing, including outstanding marlin action, was spent along the shore of Puerto Escondido. As they settled into their sleeping bags one night, Cliff Brignall, owner of Fenwick Rods and Sevenstrand Tackle, was camping on the beach in front of the Oasis Hotel construction site and visited their camp to tell them that the Port Captain was very concerned. The boys had no boat permit! 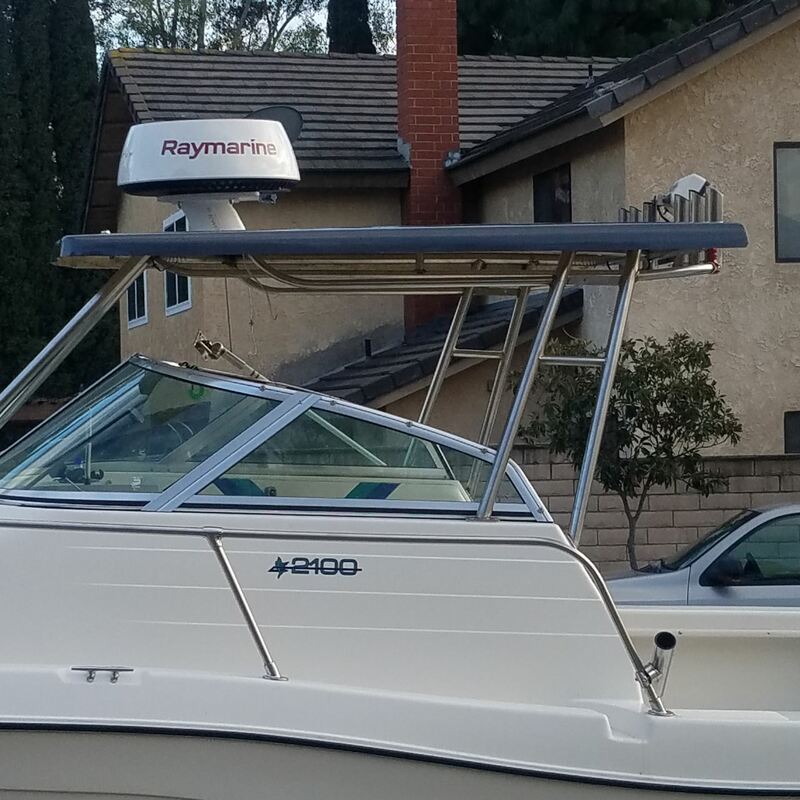 The Port Captain planned to seize the boat and take them into custody, according to Brignall. He had explained to the Captain, that he knew them personally and he and Ralph’s father were members of the Southern California Tuna Club. Still, Cliff advised the boys to leave immediately. They broke camp and departed to the south under cover of darkness. Realizing they didn’t have enough fuel to get to La Paz, they headed to Isla San Jose. Arriving mid-morning, they attempted to purchase gasoline from local fishermen, but were told they had none available. As they considered their options, a fish with a large tailfin slowly cruised through the cove. There was an uproar as several of the fishermen spotted it, raced to their canoes and began paddling after the tailfin. An hour later, the canoes returned to the anchorage with a huge black marlin in excess of 200 pounds in tow — the women immediately carved the fish into chunks. By mid-afternoon, they were at last underway toward La Paz, but heading directly into the 15- to 20-knot afternoon wind turned out to be the most demanding leg of the journey. Even slowing to five knots, spray from each wave required they pump the bilge every few minutes until they neared La Paz and the winds calmed. In La Paz, they bought enough fuel to get them to Las Cruces. Anchoring the boat near the beach, they swam two 5-gallon cans to the beach, hailed a cab to a service station, filled the cans and taxied back to the beach. They swam the tanks out to the boat and immediately headed east toward Punta Coyote — all in an hour. 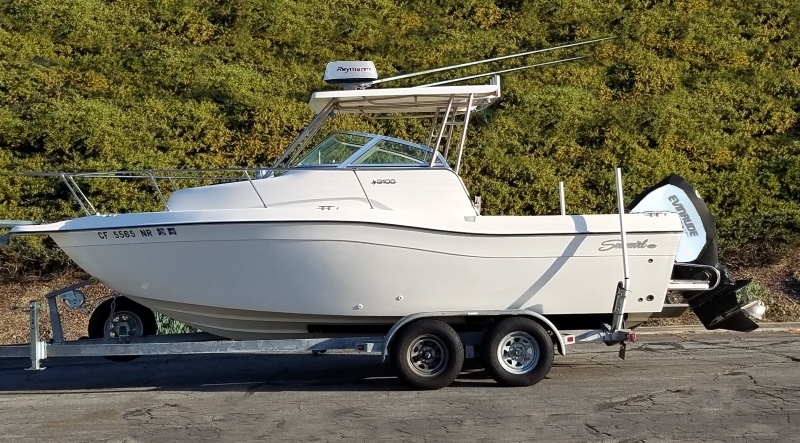 There, they decided to spend the night before continuing on, remembering that on their previous trip, the skipper of the fishing boat had shown them how to easily pick up “hatchet scallops” in waist-deep water from the sandy bottom in the cove just east of Punta Coyote. Their memory rewarded them with a grand scallop feast. Cruising to Las Cruces the following morning, the bilges still required pumping every few minutes in spite of the calm sea and no wind. Upon arrival at Las Cruces, they spoke with the manager, who let them camp on the beach near the fishing boats. The next morning, they hauled the boat onto the beach to see why it was leaking. As several guests watched, the boat was turned upside down. 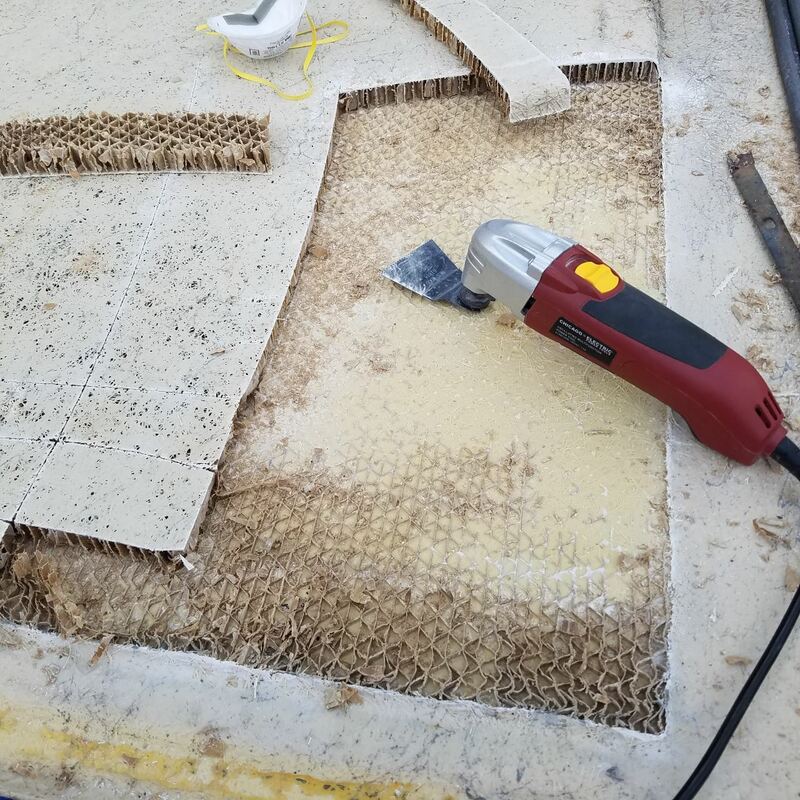 Over 800 miles of travel in the open sea along with the constant pounding through the waves had delaminated and washed away the fiberglass, leaving a couple square feet of bare, unpainted plywood. 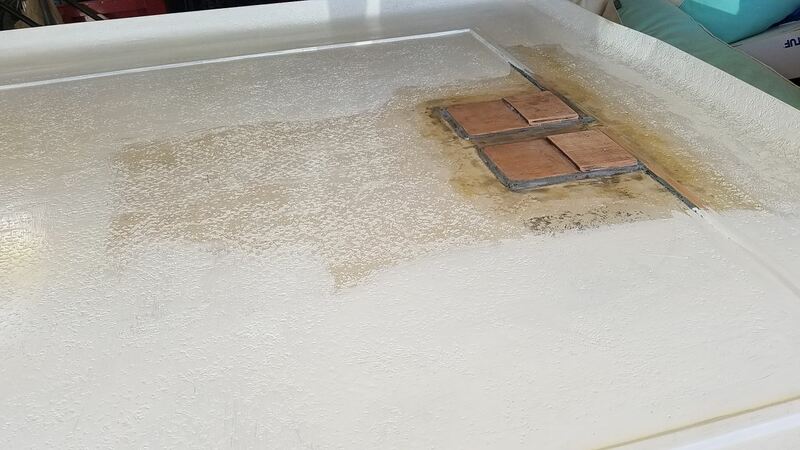 Fortunately, an American doctor at Las Cruces offered to fly his Aero Commander to La Paz for the fiberglass material they needed to recoat the bottom of the boat. Repairs were complete the following afternoon and the boat was back in the water. After releasing a few marlin near Isla Cerralvo the following day, they decided to continue south to their final destination of Cabo San Lucas. That evening after dinner they were loading the boat at the concrete pier in front of the Las Cruces Hotel when a distinguished looking young gentleman walked out on the pier and introduced himself as Mr. Rodriquez. 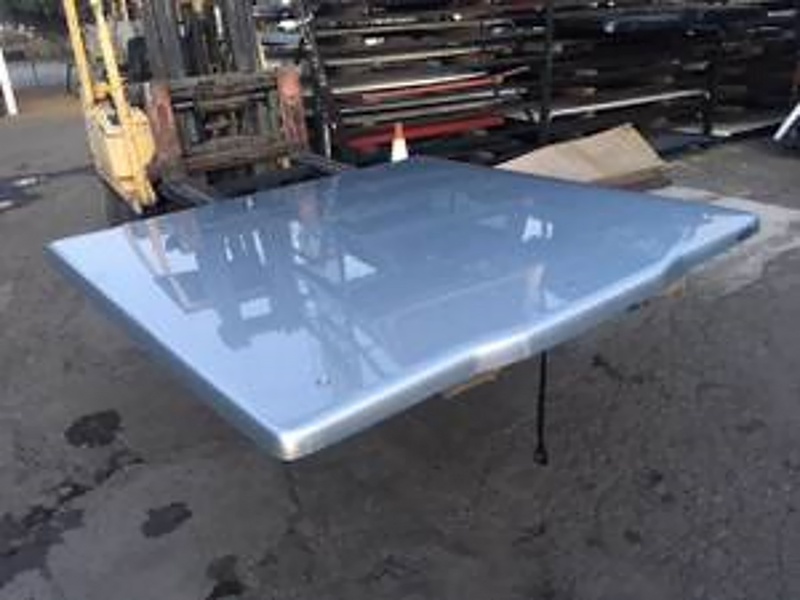 They explained that they were within two days of achieving their goal of taking their small boat on its own bottom from San Felipe to Cabo San Lucas. Although polite, Mr. Rodriguez was skeptical. “Well, if you make it to Palmilla, a resort I am developing a few miles east of Cabo San Lucas, I’ll treat all of you to a margarita,” he said. Obviously, an offer of that kind to three 19-year-olds made a huge impression and they were determined to cash in. As they trolled south the next day, the swells were greater than what they had experienced during the trip thus far. They were nearing the open ocean. At midday, Clock sighted the “yellow bluffs” north of Rancho Buena Vista. An avid fan of Ray Cannon’s weekly columns in Western Outdoor News, he remembered a story about the good yellowfin tuna fishing just offshore from there. They trolled around and caught several 20-pound yellowfin. When they arrived at Rancho Buena Vista Hotel, Chuck Walters, son of the founder, Colonel Eugene Walters, came out to meet them. Amused at their story, he treated them to dinner and let them pitch their sleeping bags on the beach. The next day they continued to fish their way down the coast past Punta Arena, another one of Cannon’s favorites fishing spots for roosterfish. They saw purse seiners and smaller commercial fishing boats, but no more fishermen in canoes — they were in the open ocean. Rounding Punta Gordo, they strained their eyes looking for Hotel Palmilla as the free margarita flashed before their eyes. Finally, a single white building came into view. Beaching the boat, they hurried up the face of the bluff and entered the building. Mr. Rodriguez was sitting at one of the restaurant tables. The boys reveled in the glory of having accomplished 99 percent of their goal. By then, it was late in the afternoon, so they had dinner and slept on the beach in front of the resort. Later they learned that Mr. Rodriguez, the son of the former president of Mexico and had served as a fighter pilot in the U.S. Air Force in Korea. The following morning, the boys left at daylight for Cape Rocks. They were in the open ocean with 3- to 4-foot swells, but not much wind. When they arrived at Cape Rocks, they slowed and filmed several sequences of movies of the point and beaches on both sides. Of course, there was absolutely nothing there, not one palapa visible from the water. They steered the boat north with their feather jigs bubbling in the wake and almost immediately hooked a sailfish. They began the return trip up the Gulf on July 4 with wind and seas off the stern and a lighter load. The trip was relatively uneventful except for a sandstorm blowing out to sea. Ralph was blinded and his eyes inflamed so his pals made him lie in the bottom of the boat with his eyes covered. At Los Angeles Bay, they found the town’s first-aid man who administered a shot of penicillin and swabbed the sand out of Ralph’s eyes to ease the pain. The treatment worked and possibly saved Ralph’s eyes from further damage. 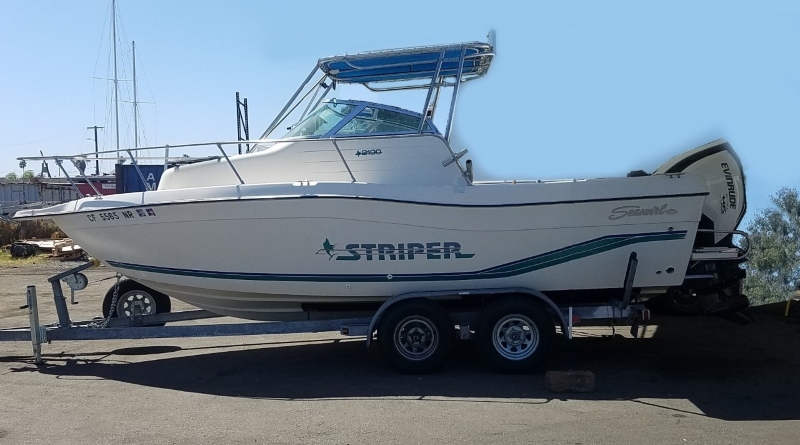 When they finally motored into San Felipe, with 1,500 miles of water and a treasure chest of adventures behind them, Tad was waiting with the trailer. The faithful 30-hp Evinrude was still perking, even with a cracked housing on the shaft from when they hit a submerged rock on the return trip. Over the course of the trip, the motor had only required a spark plug change. Once, while doing maintenance chores, two of the boys hooked marlin simultaneously. Talk about a teenage ball — one man changing plugs while the other two fight marlin! By the time the trip was over, the boys had lost count of the number of billfish released as well as the roosterfish, pargo, bonito, yellowfin tuna and sierra mackerel they caught. The four young men conquered the Sea of Cortez traveling the length of the Baja Peninsula in a 15½-foot boat better suited for the Salton Sea than the Sea of Cortez. They set a new record for distance traveled in the Sea of Cortez by a small boat, approximately 1,500 miles in three weeks. 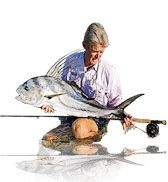 Thousands of small boaters have followed these pioneers by sea and land, meeting the challenge of navigating the Sea of Cortez and later hauling boats of all sizes and descriptions down Mex 1 to enjoy the fabled Baja fishing — a course that is now charted. When those four left San Felipe, they sought out an unknown adventure. And they found it!